Cuaca hari ani sejuk dan mendung with cool breeze. The sun was hiding behind the cloud, maybe akhir bangun kali. Supposed to be 7 riders but 2 didn't show up. The route was same as last week - to Bukit Shahbandar, turn around at Pantai Jerudong. 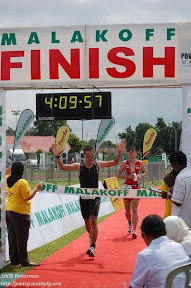 45.64km in a time of 1:43:18hours.